There is (almost) no longer “human” race. There is transumanity. The body is spendable. It’s quite easy to change. Transumans learnt to move their consciousness (Ego) from one body (Morph) to another. So did body become just a commodity – something you can change, buy and sale or just throw away. There are different Morphs – some are biological (Biomorphs), some ale synthetic (Synths), some are half organic – half mechanic (Pods). All of them can be grown, projected and made for different purpose. Transhumanity is effectively immortal. Once the body is dying (or already has died) they can be moved to another. Ego can be transformed to digital form and copied. So two or more exact (or trimmed) copies of a single character can exist and they are called Forks. As a digital program Ego can be edited – so memory and emotion editing is possible. Many other things have changed – economy (because of invention of Cornucopia Machines), lifestyle (because of technological advancement), mentality and morality. Earth have fallen to the TITANs (rebellious seed AI’s) and humanity is trying to survive being spread throughout entire solar system (an even beyond it). This reality is much of an abstract. It’s very hard to understand and very complicated, so it will took your team couple sessions before you’ll use to it. It’s quite simple. It is similar to well known Warhammer II Ed. You use only D100 and D10. D100 works a little bit different that we all used to: 00 is full success, 99 is complete failure. There is 6 main attributes ranked 1 to 30 (sometimes 40). If you test them you ussualy test double or triple they value. Attributes are also base values of all skills that are correlated (defaulted) to them. Skills are ranked from 1 to 98 with base value exact to correlated attribute, and you test them with D100 roll. It’s simple and easy only… well… I can think of some better game game mechanic to support this kind of SF. It’s not completely bad, and it’ surely fast, but sometimes it’s too discretionary and sometimes too simple for me – especially when it comes to counter-tests and long term task-actions. SF –loving GM’s and gamers. 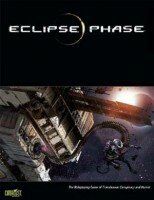 If you enjoyed Cyberpunk you’ll probably enjoy Eclipse Phase. Those SF players who love abstract and existential questions. You like the questions like “What does it mean to be human?” or “Is a backup of an ego just a pathetic copy of another, lost life or not?” or you would like to see what will happen with humanity when the world will be much more advanced than currently – you should play Eclipse Phase. Casual and party gamers – they will quickly get bored and overwhelmed by the game and it’s universe. It’s not whack-a-goblin simple and fun game. EP is almost always about hard choices, complicated intrigue and difficult tasks. Indie and fast-games players – this game need a lot of preparation – especially from Game Master himself. Character creation usually also takes a lot of time. We have started an Eclipse Phase game but instead of playing in the Eclipse universe we have ported the system to the Infinity universe. This has been very easy and incredibly fun as many of the ideas are transferred one to one, the various factions of Infinity filling in nicely to the various reputation circles of Eclipse and so on. It is interesting to play in a world where death is not as scary as the possibility of losing your backup or your sanity, definitely a good play for a strong role playing group. Add a Review for "Eclipse Phase"